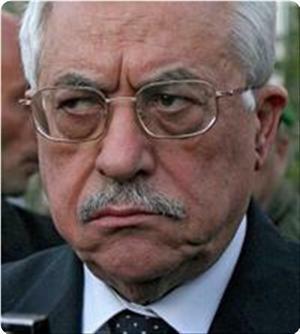 Palestinian Prime Minister Ismail Haneyya warned of the return to the negotiations between the Palestinian Authority and the occupation. This came in a speech Haneyya delivered during the special session of the Palestinian Legislative Council held on Tuesday at its headquarters in Gaza City, about the seriousness of the negotiations. The Prime Minister urged Palestinian Authority Chairman Mahmoud Abbas and Fatah movement to stop the negotiations with the Israeli occupation and called for establishing "a national coalition to announce rejection of negotiations and adherence to the Palestinian national constants." "The return to negotiations reflects the status of failure and frustration experienced by the Palestinian Authority in Ramallah," Haneyya said, stressing that "the political choices should not be built on concessions." Gaza Premier described the return to negotiations as "a catastrophic choice" that lasted twenty years and served only the Israeli occupation. He called for ending the Palestinian split, considering that as "an important step on the road to rebuilding the institutions of the Palestinian people." Concerning the situation in Egypt, Haneyya stressed that all Palestinians support the Egyptian people, and denied any Palestinian interference in Egypt. He denounced the Egyptian media fierce attack which aims to drag the name of the Gaza Strip in the events and clashes taking place in the Sinai between armed forces and the Egyptian army, and said that "these media policies come to justify any future policies targeting the Gaza Strip and the resistance." The Palestinian Prime Minister urged "all the wise people inside and outside Egypt to put an end to this campaign against the Strip." For his part; Dr. Khalil Hayya, the member of the political bureau of Hamas and the head of the Political Committee in the PLC, gave an extensive report on the seriousness of the negotiations on the Palestinian situation. He called for organizing "a campaign to reject the return to the negotiations and the waiver of the Palestinian national constants." Hayya warned that the Arab countries' preoccupation with their revolutions will give the occupation the opportunity to impose its own agenda on the Palestinian negotiator. Israeli and Palestinian negotiators met secretly in Jerusalem on Tuesday, a senior Palestinian official said, a week after US-brokered peace talks were relaunched in the Holy City. "A meeting was held today between the Palestinian delegation, headed by Saeb Erakat and Mohammad Shtayyeh, and the Israeli delegation of (Justice Minister) Tzipi Livni and Yitzhak Molcho," the official said on condition of anonymity. Details of the discussions were not revealed, apparently consistent with a request from Washington last week for a strict news blackout. The official added that US Secretary of State Kerry's special envoy Martin Indyk met President Mahmoud Abbas on Monday to keep up pressure to continue negotiations "despite continued settlement building, which is the biggest obstacle to talks carrying on." The Wednesday meetings were overshadowed, however, by a new row over Israeli settlement plans for the occupied territories. UN chief Ban Ki-moon told reporters on a visit to the West Bank town of Ramallah that he was "deeply troubled by Israel's continued settlement activity in the West Bank, including east Jerusalem. "Settlement activity is deepening the Palestinian people's mistrust in the seriousness on the Israeli side toward achieving peace. "It will ultimately render a two-state solution impossible," he warned. But Israel's Prime Minister Benjamin Netanyahu played down the settlements issue at a meeting with Ban later the same day. "The root cause (of the conflict) was and remains the persistent refusal to recognize the Jewish state in any boundary," he said. "It doesn't have to do with the settlements - that's an issue that has to be resolved, but this is not the reason that we have a continual conflict." Peace talks broke down just weeks after they began in September 2010 over the issue of settlement building. A political analyst says that talks between Palestinian Authority and Israel will not achieve anything for the Palestinian people, Press TV reports. “The talks will bring more security achievement and more settlement buildings for the Israelis,” the professor added. He went on to say that “The Israeli regime is trying to use the talks in order to influence the Palestinian Authority to give up some of the Palestinian rights, at the same time to buy more time to use the time to expand settlements." 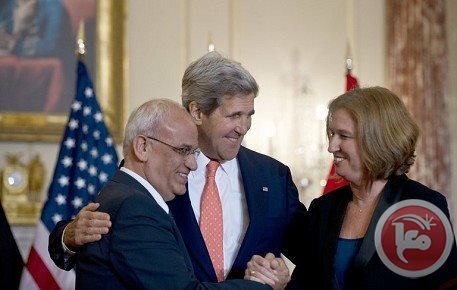 In late July, the Palestinian Authority and the Israeli regime resumed their talks in Washington. Last Palestinian-Israeli talks had broken down in September 2010 after Tel Aviv refused to freeze its settlement activities in the occupied West Bank. On August 13, Tel Aviv announced that another 900 new illegal settlements would be constructed in Gilo in East al-Quds in addition to 1,200 settler homes approved by the regime a few days earlier. The United Nations and most countries regard the Israeli settlements as illegal because the territories were captured by Israel in a war in 1967 and are hence subject to the Geneva Convention, which forbids construction on occupied lands. 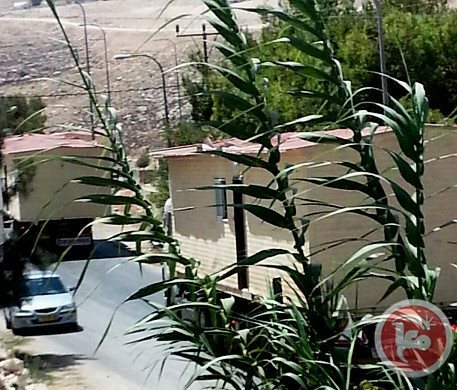 Israeli lorries were seen Monday unloading new mobile homes at Israeli settlements in east Bethlehem in the southern West Bank. 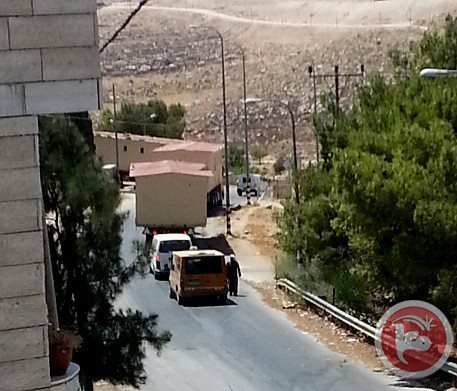 Locals told Ma’an that at least five new movable houses were unloaded Monday in Noqedim settlement near Herodium east of Bethlehem. Noqedim is home of the right-wing former Israeli foreign minister Avigdor Liberman the leader of the right wing Yesrael Beitenu political party. Witnesses noted construction in Bethlehem-area settlements, which has been ongoing forfive years, increased noticeably in recent weeks. Palestinian leaders are warning that Israel is using the US-led talks with the Palestinian Authority as a political cover for expanding its illegal settlements, Press TV reports. “The PLO Executive Committee considers the unprecedented settler decisions which were announced by the occupation government as conclusive proof that Israel’s first and last option remains expansionism, Judaization and theft of Palestinian land, and not ending occupation and implementing the two-state solution on the basis of the 1967 borders,” Palestine Liberation Organization (PLO) said in a Monday statement. The PLO Executive Committee issued the statement during a meeting headed by acting Palestinian Authority Chief Mahmoud Abbas in the West Bank city of Ramallah. They committee said it sees poor prospects for the negotiations as Israel unveils plans to build new settlers units in the occupied Palestinian territories. Much of the international community regards the Israeli settlements illegal because the territories were captured by the Tel Aviv regime in a war in 1967, and are hence subject to the Geneva Conventions, which forbid construction on occupied lands. Recently, israelis met for “negotiations” with Palestinian political prostitutes in the USA, israel and other places, so that they could reach a deal in which the PA renounces more Palestinian rights and sells the rest of Palestine to the jews. A series of moves by israel over recent days to step up construction in its colonies in the West Bank and East Jerusalem added to a potent mix of blame, bluster and suspicion surrounding the talks. Israel announced on Tuesday that more than 900 new homes would be built in Gilo, a settlement across the pre-1967 Green Line in Jerusalem. 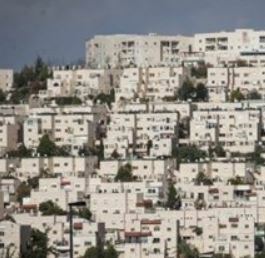 On Sunday it approved further 1,200 new housing units in settlements in the West Bank and East Jerusalem. All settlements in the West Bank and East Jerusalem are illegal under international law. The PA has taken the decision to participate in the negotiations with Israel without first consulting with the Palestinian people. The PA has actually banned all Palestinian political factions from peaceful demonstrating against their illegal and illegitimate decision to “negotiate”; a number of politicians were arrested. The Palestinian Authority headed by Mahmoud Abbas, who presidential term expired in 2009 but still receives full support from USA, israel and western countries for is treachery, established the nucleus of a dictatorial regime in Palestine that does not respect human rights and brutally prohibits and represses freedom of expressions by the Palestinian opposition. Abbas personally runs all sensitive positions in Palestine, he is the President of the Palestinian Authority, the president of the PLO (a political party), the executive chairman of and Central Committees of Fatah (another political party), president of the Palestinian Legislative Council (parliament), the top official of the judiciary system, and on top of that he controls all the financial channels which pump Euros and dollars into Palestine. Prime Minister Rami Hamdallah Sunday signed a $148 million agreement with the US government, represented by U.S. Consul General Michael Ratney, to support the Palestinian Authority’s budget. Hamdallah commended, during the signing ceremony, the US’s constant support for the Palestinians, stressing that such support contributes to the empowerment of institutions of the Palestinian state to provide basic services to Palestinians. Ratney stressed the US’s commitment to support Palestinians and their national authority, and the efforts of Hamdallah and his government to the advancement of state institutions. 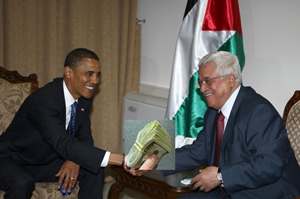 He said that such aid is a proof of the US’s commitment to support the Palestinian economy and people. Hanna claimed that Israel aims to obliterate any Arab presence in the holy city, as it continues with its settlement plans. Dr. Haidar Eid speaks about opposition in Gaza to the renewed peace negotiations, the need for Palestinian self-critique concerning the current politica, waning support for Hamas and the current situation in Gaza. Eid: what is happening now in Gaza is a slow genocide. Dr Haidar Eid is Associate Professor in the Department of English Literature, Al-Aqsa University, Gaza Strip, Palestine. 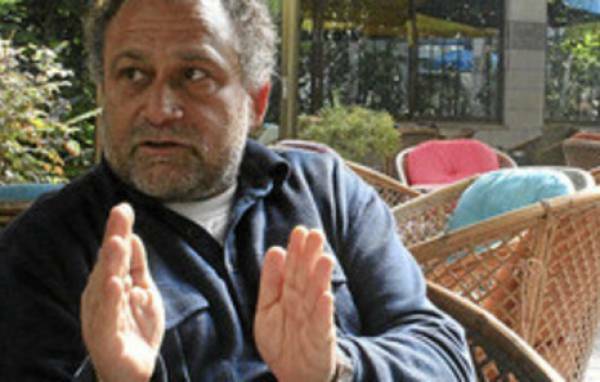 Dr Eid is a founding member of the One Democratic State Group (ODSG) and a member of the Palestinian Campaign for the Academic and Cultural Boycott of Israel. The world looks to a new round of negotiations under US Secretary of State Kerry – where is Gaza in those talks? Gaza is diverse and I cannot speak for Gaza as one, but clearly most here are opposed to negotiations. 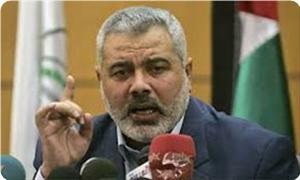 Hamas laid out its official position on Tuesday: officials expressed their dismay at the resumption of talks. Most organizations within the Palestinian Liberation Organization (PLO) – among them the Popular as well as the Democratic Front for the Liberation of Palestine (PFLP and DFLP) – oppose the talks. Only some members of Fatah have fallen for the lie that negotiations might bring a viable solution. Speaking for myself, as an advocate for one democratic state of Palestine, I oppose the talks, which aim at a two-state solution. We believe that creating two states is no true solution but a racist one. Two viable states have become impossible to achieve – mainly because Israel has created facts on the ground that subvert the whole concept. But more than that: the two state solution doe not guarantee even a minimum of rights for the Palestinians. There is no talk anymore of the right of return for those refugees from villages and towns that were ethnically cleansed in 1948. 75-80 % of Gaza’s population are refugees and international law provides for their return – what's for them? The Oslo accords never incorporated international law. And most importantly: they never dealt with Israel’s racist measures and apartheid system against Palestinians. What alternative would you favor? Fatah is the only force officially supporting negotiations. When I oppose them, I do not represent only Gazans but the majority of Palestinians. Our alternative? Stick to the call supported by most organizations in 2005: Boycott, Divestment and Sanctions (BDS)! The campaign calls on the international community to boycott Israel, divest from its economy and impose sanctions until Israel complies with international law. Then, when there is pressure, we can negotiate. In South Africa the ANC did not negotiate before it had substantial backing. We cannot negotiate about basic rights: equal rights must be the basis for negotiations about any kind of state! The only just solution is one like in Northern Ireland and South Africa, meaning a secular, democratic state for all. The first step: serious self-critique. Palestinians have to publicly consider what the leadership of PLO and Hamas have done to the Palestinian cause since the Oslo accords were struck. The past 20 years have led us nowhere. Instead, settlements have expanded and Gaza has been transformed into the largest concentration camp on earth. Serious self-critique will, secondly, lead to dismantlement of the PA. The institution of the PA gives the wrong impression to the international community of an equality of sides. As if Palestinians had an army and occupied a people! We as Palestinians should have a local administration to organize daily life and the resistance, not undermine it. Thirdly, we have to forget about the two-state solution. It is a complete waste of time and energy. We should all be talking about one democratic state, because two states are a fiction. What is the situation in Gaza like at the moment? How isolated is the population? The situation has deteriorated. Israel has tightened its closure. Things turned worse in the last days of Morsi’s government in Egypt, when it was decided to destroy all tunnels [on the Egyptian-Gazan border] that are vital for the supply of all basic goods here. After Morsi was ousted the destruction of tunnels continued, and now most are closed. Furthermore, the only official crossing to Egypt, Rafah, is frequently closed, for example today. Rafah is vital! As all crossing points to Israel are virtually closed, Rafah is the bottleneck out of Gaza. Hamas first renounced the Syrian regime and Hezbollah, now it lost the Muslim Brotherhood as a mighty ally in Egypt. What does this mean for the Hamas government? Hamas is in a limbo now. It lost its most important strategic alliances with Iran and Hezbollah, which it gave up for closer relations with the Muslim Brotherhood and Qatar. Now that the Muslim Brothers are deposed from the government in Egypt, Hamas is left hanging in the air. And the new Emir in Qatar is showing a new style of diplomacy, increasing pressure on Hamas. Hamas, as a matter of fact, does not have a clear-cut political vision. You keep hearing different, contradictory positions from various officials. This has also affected talks for reconciliation with Fatah in the West Bank, which have effectively come to a halt. Gaza is controlled by Hamas, yes, but Hamas is no more than the leading prisoner among the 1.7 million prisoners of Gaza. What are the current topics of Gaza’s internal politics? First is the need to end this deadly, medieval siege imposed on Gaza in 2006. A slow genocide is happening here that has already caused the death of over 200,000 who did not receive vital medical treatment. The rate of malnutrition in Gaza is the highest worldwide. The end of this siege will only come within a political solution to the Palestinian question as a whole. When we talk about negotiations, we are talking about Gaza’s fate as well. That is also why us activists in Gaza promote BDS so strongly. We are highly affected by what is happening in Egypt. We are holding our breath right now. We want Egypt to open the Rafah crossing 27/7. It is our only option right now so as to not make us utter hostages to Israel’s will. And how much support does Hamas enjoy in Gaza today? Hamas has lost a lot of its popularity as it resorted to repressive tools and tactics against its opponents. Most people who voted for Hamas did so not because they were for Hamas, but because they were against the corruption of the PA and the concept of a two-state solution. As such, Hamas was the only option. Now people are questioning everything that Hamas said before the election. It promised resistance, but in fact since the agreements with Israel it does not allow any kind of independent and popular resistance anymore. For me, there is one proper vision: A solution for Palestine as a whole that implements UN Resolution 194 which calls for the right of return for all refugees and compensation for their decades in exile. Gaza should become part of one secular democratic state called Palestine. Israel has another vision: it wants to get rid of Gaza. It wants Gaza to become part of Egypt like it was before 1967 to get rid of all its Gaza problems. The Egyptians do not want and will not allow that. Instead, what is happening now is a slow genocide in Gaza. Israel and Palestinian officials held a meeting, last week, in the Hungarian capital, Budapest, and discussed the efforts to ensure the continuation of the recently resumed direct peace talks, mediated by the United States. Israeli daily, Maariv, reported Sunday that members of Knesset (MK’s) of the Yesh Atid Party (There is Future) Dov Lipman, Boaz Toporovsky, and Yifat Kariv, in addition to MK Moshe Mizrahi of the Labor Party, and David Tsur of the Hatenua Party, met with Fateh officials Qaddoura Fares and Sameeh Al-Abed, legislators Abdullah Abdullah, and Jamal Zaqqout. 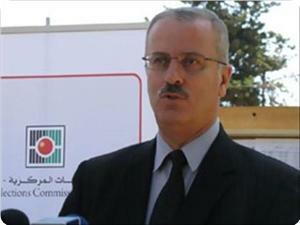 MK Kariv stated that the meeting was held to help boost direct peace talks between the Palestinians and Israel. “The sooner we achieve the two-state solution, the better it is for both sides”, she said, “I left the meeting knowing we can talk with them”. “Any support to a one-state solution from the river to the sea harms the peace process”, Kariv added, “The Israeli government also needs to make some responsible and brave decisions”. Responding to a question regarding the effects of political stances of her party on the coalition with the Jewish Home Party, she said that “the two parties helped form the current government in Israel”, and added that “whenever a difference in political stances emerge, we need to find common ground”. The convening Palestinian and Israeli officials agreed on issuing a joint statement that would “pressure Israeli and Palestinian leaders to reach an agreement”, and expressed support to the Geneva Initiative for peace. On his part, Fares confirmed the meeting took place, but did not give any further statements or details. 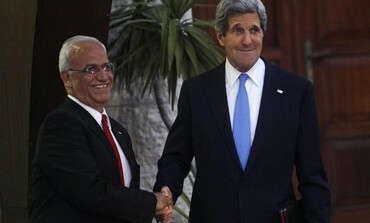 Officials say Kerry gave Abbas assurances that Israel would decrease construction in settlement blocs while talks last. Palestinian officials in Ramallah have accused the US administration of deceiving and misinforming the Palestinian Authority with regards to the peace talks with Israel. The officials told the London- based Al-Hayat newspaper that they were concerned about the US administration’s role in the peace talks with Israel – renewed last month after a three-year standoff – especially its position on plans to build homes in settlements and east Jerusalem neighborhoods. After the latest session on Wednesday, the officials had met with PA President Mahmoud Abbas on Thursday and heard from him about the peace talks with Israel. According to the newspaper, some of the Palestinian officials accused Washington of “deception and misinformation” in order to keep the PA at the negotiating table with Israel. The officials also expressed concern that the US would dupe the PA into accepting a state with provisional borders, the newspaper said. A senior Palestinian official told Al-Hayat that US Secretary of State John Kerry gave the Palestinians assurances that Israel would reduce construction in settlement blocs. The official also claimed that Kerry promised that Israel would halt construction in settlements outside the blocs during the peace negotiations. “It’s obvious that Kerry was either deceived by the Israelis or that he’s deceiving us in order to keep us at the negotiating table,” the official said. Some Palestinian officials voiced concern over talks between the US and Israel regarding shared security interests once a political solution is reached. 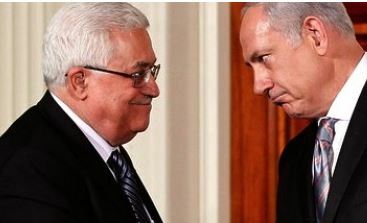 One official complained that the Palestinians were not party to these talks. The sides have provided little detail about the talks, hoping a lower profile may help them reach Washington’s ambitious goal of a deal for Palestinian statehood in nine months, despite wide gaps over key issues. On Friday, Israel’s top peace negotiator said the newly resumed talks with the Palestinians held a wider opportunity for Israel to seek alliances with Arab world moderates against radicals in the Middle East. 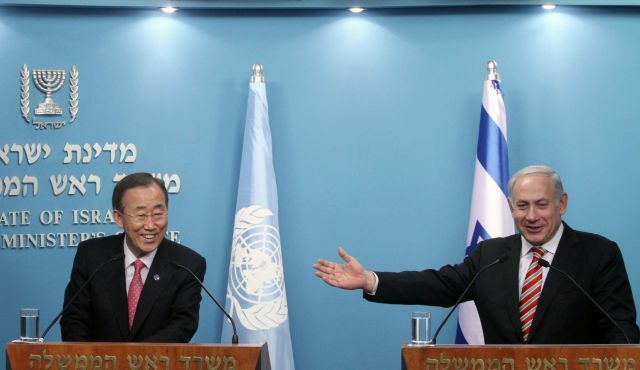 Justice Minister Tzipi Livni, speaking after a meeting about the negotiations with visiting UN Secretary-General Ban Ki-moon on Friday, declined to say whether any progress had been made. “I believe there are parts in the Arab world that for them relaunching the negotiations can be an opportunity to support this and to work together against the extremists,” she added, alluding to the turmoil in Egypt and Syria. The Arab League, Jordan and Egypt’s military-led government have welcomed the resumption of peace talks, with backing from the Arab League whose 2002 peace initiative remains on the table for possible recognition of Israel after the dispute is resolved. The UN chief was referring to plans for some 1,200 new housing units in the territory Israel captured in the Six Day War which Israel published ahead of last week’s talks. Ban praised Israel’s release of 26 of the 104 security prisoners promised under a deal that led to resuming peace talks, but expressed concern for 5,000 other Palestinians in Israeli jails, some of whom have been on intermittent hunger strikes. President Mahmoud Abbas said Friday that he will not agree to a Palestinian state without the Jordan Valley. Abbas made these remarks during a tour of the ancient city of Jericho. Israeli says it will keep control over the Jordan Valley that borders Jordan in any future peace agreement. The Jordan Valley is currently classified as area C under the Oslo protocols, which means it is under full Israeli military control. The Palestinians want to develop the Jordan Valley, which makes up more than 40 percent of the area of the West Bank, but Israel keeps putting obstacles in their way. 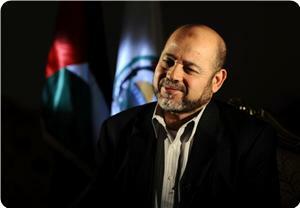 Member of Hamas's political bureau Mousa Abu Marzouk said that his Movement does not evade the reconciliation, but it refuses to provide a cover for negotiations rejected by all Palestinian political forces. Abu Marzouk revealed on his facebook page on Friday that there were serious understandings between de facto president Mahmoud Abbas and US secretary of state John Kerry. According to Abu Marzouk, these understandings include the establishment of a Palestinian state with temporary borders within the separation wall, a Palestinian recognition of Israel as a country for the Jewish people and the wall as safe borders, and Israel's retention of its major settlements in the West Bank. The Hamas official affirmed that there was no mention of Jerusalem as a Palestinian capital, except that its eastern part would be supervised for 10 years by Israel, Jordan and Palestine. Among these understandings, the official added, were finding a solution to the issue of the Palestinian refugees through a regional and international agreement that includes the establishment of a fund for them financed by the Arab Gulf states, and holding legislative and presidential elections in the West Bank without the Gaza Strip. As for Hamas in Gaza, Kerry pledged to find a solution to it, especially after what happened in Egypt, Abu Marzouk confirmed, noting that the media smear campaign led by Fatah-controlled Palestinian Authority against the Movement falls within this solution. Israeli Prime Minister, Benjamin Netanyahu, stated during his recent meeting with UN General-Secretary, Ban Ki-moon, that Israel will continue to build and expand settlements in occupied East Jerusalem, and that settlements, and what he labeled as “new neighborhoods”, and settlement blocs will always remain under Israeli sovereignty. During his meeting with Ki-moon two days ago, Netanyahu said that there is nothing to discuss or negotiate on regarding Israel’s settlements. “Everybody knows new Jewish neighborhoods in Jerusalem, all settlement blocs, will always remain under Israeli control”, he said, “There is nothing to talk about, there will be no discussion on the issue”. The Israeli Prime Minister also claimed that “it is clear everybody known that the Palestinian-Israeli conflict is not the core source of tension in the Middle East”, and alleged that “the fundamental issue, the core problem in the region, is not recognizing Israel is a state for the Jewish people”. He further claimed that the Education System in the Gaza Strip “is based on incitement against Israel”, and demanded the United Nations to examine “how summer camps run by the UNRWA, are used to foster hatred and violence in the minds of Palestinian children”, according to Netanyahu. Israel’s illegal settlement activities, built in direct violation of International Law, are amongst the core issue that obstruct direct peace talks between Israel and the Palestinians. Israel refuses to recognize most of the core issues on the conflict, and the Palestinian legitimate rights, including the Right of Return of all refugees, the right to a fully independent and continuous state with East Jerusalem as its capital, borders and natural resources. Acting Palestinian Authority Chief Mahmoud Abbas says ‘all issues on the table’ with the Tel Aviv regime has been discussed in the latest round of Palestinian-Israeli talks. “We discussed the issues which are always on the table; borders, Jerusalem (al-Quds), settlements,” Abbas said during a Thursday press conference with UN Secretary General Ban Ki-moon in the occupied West Bank city of Ramallah. 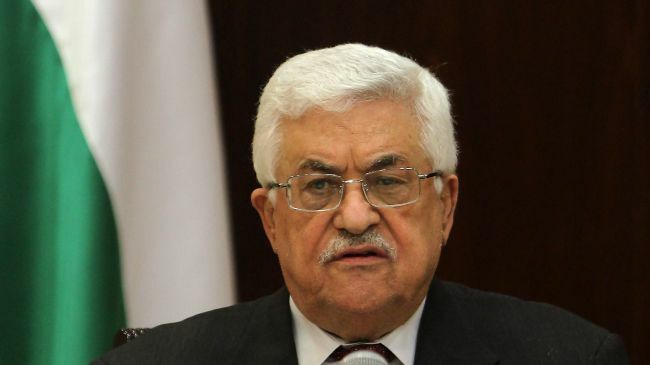 Abbas made the remarks a day after Palestinian Authority officials held another round of US-sponsored negotiations with the Israeli regime in East al-Quds (Jerusalem) amid a strict official news blackout. “Until now we didn’t speak about what happened (in the talks) and when there is something we shall tell you,” Abbas added. During the news conference, Ban criticized the Israeli regime for its illegal settlement activities in the occupied Palestinian lands. “I am deeply troubled by Israel’s continuing settlement activity in the (occupied) West Bank, including East Jerusalem (al-Quds),” said the UN secretary general. Ban met with the students as part of the UN Model international academic convention initiated by students at the College of Management. He told them he had come to the region for the sixth time to express his support for the renewed peace talks between Israel and the Palestinians. "I have never been this optimist," he said, adding that the international community had never had such expectations and hope that the peace process would reach a solution. Addressing the attitude towards Israel, Ban said that the Jewish state was a UN member and should therefore be treated equally like all other 192 member states. Unfortunately, he added, Israel has been criticized and sometimes discriminated against because of the Mideast conflict. A peace process is just a piece of paper, he said, adding that the Oslo Agreement was never implemented and remained a piece of paper. "This time I expect real peace," he said. "The Israeli and Palestinian people are neighbors and have no choice but to live in harmony and peace side by side." Asked about the split between Fatah and Hamas, the UN chief responded that reconciliation between Israel and the Palestinians was highly important. "There can be no solution of three states – the State of Israel and two Palestinian states. The vision is of a two-state solution, and that's the reason we are trying to advance a Palestinian reconciliation process," he said. Earlier Friday, Ban met with Prime Minister Benjamin Netanyahu, who told him that the root of the Israeli-Palestinian conflict was the refusal to recognize the Jewish state "on any border" and had nothing to do with Israel's settlement enterprise. Ban also met with President Shimon Peres and stated that negotiations were the best way to move towards a two-state solution. He said this was a critical moment for Israel. Prime Minister Benjamin Netanyahu said in a meeting with UN chief Ban Ki-moon, who is visiting Israel, that the root of the Israeli-Palestinian conflict is the refusal to recognize the Jewish state "on any border" and has nothing to do with Israel's settlement enterprise. Netanyahu said he was looking forward to discussing regional issues with Ban, foremost Iran's attempts at obtaining a nuclear weapon and the Syrian civil war. The prime minister said it was important to discuss "the real issues" and not those that usually get more attention such as the Israeli-Palestinian conflict. He remarked that until recently the Israeli-Palestinian conflict was commonly cited as the root of instability in the Middle East but that this was no longer applicable in the wake of unrest in the Arab and Muslim world. Addressing the Palestinian issue, the prime minister said that the conflict began before even one settlement was established. He noted that attacks against Israel continued despite the Gaza pullout and that this was because of a fundamental rejection of the Jewish state. He stressed that construction in areas such as Gilo or in settlement blocs, which he said everyone including the Palestinians knows would stay under Israeli sovereignty in a future agreement, should not be the main issue of discussion. The main issue should be how to achieve a demilitarized Palestinian state that will recognize the one and only Jewish state, according to Netanyahu. Earlier on Friday, Ban met with President Shimon Peres and stated that negotiations were the best way to move towards a two-state solution. He said this was a critical moment for Israel. United Nations Secretary General Ban Ki-moon has criticized Israel for its continued illegitimate settlement activities in the occupied Palestinian territories. The UN chief made the remarks during a joint news conference with acting Palestinian Authority (PA) chief Mahmoud Abbas in Ramallah on Thursday, a day after PA officials, under pressure from the United States, agreed to begin negotiations with Israeli officials over the terms of a Palestinian state. "The settlement activity is deepening the Palestinian people's mistrust in the seriousness on the Israeli side toward achieving peace. It will ultimately render a two-state solution impossible," he added. In an interview with Press TV on August 2, Iranian political analyst Hamid Golpira said that Israelis want neither a one-state solution nor a two-state solution for Palestine, rather they want a no-state solution. “The two-state solution, if it could happen in a proper way, could even be an acceptable thing for the people who want a one-state solution in the future. They could see it… as one step toward a one-state solution,” Golpira said. He added that what “some of the Israelis, especially people like Mr. Netanyahu, are presenting… neither is the one-state solution nor is the two-state solution. It is more of a no-state solution, meaning, they want no state for Palestine, or no viable state. Israel has announced plans to build more than 3,000 new settlement units on the occupied Palestinian land. Palestinian officials involved in the direct talks with Tel Aviv have reported that the latest round of direct Palestinian-Israeli talks, held late on Wednesday at night, was very stormy due to Israel’s decision to build hundreds of units in illegal West Bank settlements. The officials warned that the Israeli violations, topped by its illegal settlement activities would kill any chances of successful peace talks, and added that the American Mediator, Secretary of State John Kerry, vowed before the talks started that Israel would stop all constructions in West Bank and Jerusalem settlements, and to decrease settlement construction activities in West Bank settlement blocs. Following the stormy four-hour long session, the two sides decided to hold another round of talks in the West Bank city of Jericho. On Thursday, the special Palestinian Political Committee, supervising talks with Tel Aviv, held a meeting headed by President Mahmoud Abbas, while some members of the committee objected to resuming direct talks with Tel Aviv amidst ongoing and escalating violations. Palestinian Presidency Spokesperson, Nabil Abu Rodeina, stated that Israel’s settlement activities are very serious violations that prove Israel is not interested in peace, and denounced the illegal Israeli decision to confiscate property of displaced Palestinians in occupied Jerusalem, under the so-called absentee property law. Israeli government's legal advisor, Yehuda Feinstein, recently approved a decision authorizing the Israeli government to control, and illegally confiscate, Palestinian property in occupied Jerusalem, should the Palestinian owners be “involved in security violations”, and to maintain Jewish majority, especially if the neighbors of the Arab property are Jews, the Radio Bethlehem 2000 have reported. Meanwhile, Israeli media sources have quoted a number of Israeli ministers stating that the chances of successful and productive peace talks with the Palestinians are very slim, and that “previous experiences showed that the only way to reach an agreement is through secret channels, and not through direct talks supervised by the United States”. Israel daily, Maariv, quoted a senior Israeli official stating the Kerry was informed beforehand of the Israeli decision to build 1200 units in Jewish settlements in Jerusalem and the West Bank, and a thousand more units in the Gilo settlement. An Israeli official stated that Kerry phoned Netanyahu demanding him to stop settlement activities, and added, “But it is just for show, just words, it’s all meant to convince the Palestinians to return to the negotiations table”. The official added that Israel released 26 Palestinian detainees just to appease the United States, so that it supports Israel in its positions regarding the Iranian file, the developments in Egypt and Syria, and to convince the U.S to foil any Palestinian move at the United Nations. Israel also wants to pressure the European Union into refraining from any decisions against Israel, decisions that would increase its international isolation, mainly decisions against Israel’s settlements, and settlement products. The official further stated that he does not believes a crisis could take place between Israel and the United States within the coming six months should talks fail. In other news, Israeli Yedioth Aharonoth, have reported that Israel intends to hand the Palestinian Authority the remains of Palestinians killed many years ago. Palestinian Minister of Civil Affairs, Hasan Al-Sheikh, confirmed the news, while officials at the Netanyahu office completely denied the report. It is worth mentioning that leftist Israeli peace group, Meretz, initiated a campaign on the internet and social websites, calling for full Israeli withdrawal from occupied East Jerusalem, and a full Israeli withdrawal from the Palestinian territories occupied in 1967, with certain land swaps. Meretz head, Zahava Gal-On, stated on her Facebook page that there can be no peace agreement as long as Israel continues to build settlements, adding that although her party, represented by six seats, has no decision-making power; it will be an opposition that seeks peace, and will vote for a peace agreement. “Netanyahu is refusing to stop constructions in West Bank settlements”, she said, “He is refusing the sign the economic treaty with the European Union due to the fact the EU does not invest in settlements, this shows that the Netanyahu government wants occupation, not peace”.